Note: As we were nearing the deadline for this story U.S. Attorney General Jeff Sessions revoked President Obama’s Cole Memorandum, which protects individuals from federal prosecution in states that have legalized marijuana as long as they abide by their state’s laws. This could potentially shake things up in Massachusetts as our burgeoning marijuana industry takes its next step toward legalized recreational pot. Though Governor Charlie Baker and state Attorney General Maura Healey insist the will of the voters will be observed, Trump-appointed U.S. Attorney Andrew Lelling has been less reassuring. In a statement released in early January he noted: “Congress has unambiguously made it a federal crime to cultivate, distribute and/or possess marijuana. As a law enforcement officer in the Executive Branch, it is my sworn responsibility to enforce that law.” The general consensus among experts in the field is that individual users and the medical marijuana market should be fine, as long as they follow state laws. But this is still a fluid situation. If anybody had told me, back when my son Craig was in high school, that one day he and I would be standing in his closet deep in consultation over the health of my marijuana plant, I would have said they were high. The thriving green plant, which until recently I had only seen in its dried form—rolled into joints in my youth and as fragrant buds not always hidden as well as they might have been in my son’s—used to be a source of contention between us. Yet over the past several months we have spent no small amount of time both admiring and fretting over the flourishing greenery that I raised from a tiny seed. I have never been a marijuana enthusiast. I don’t have anything against it and certainly do not agree with the government official who famously maintained, “Good people don’t smoke marijuana.” But even when I was younger, it just wasn’t my substance of choice. I have also never been a gardener. Few things are less appealing to me than crawling around in the dirt with the sun pounding down on my skull. And I stopped keeping houseplants after one too many stopped staying alive; I never knew whether I was watering too much or too little. But when I learned last summer about a Boston-based company selling grow-at-home marijuana kits, something clicked. As a longtime migraine sufferer, I have been intrigued by marijuana’s purported pain-relieving properties for several years. And a kit sounded easy. Plus, not that it really matters, but here was a chance to restore my standing with my son’s friends, who once considered me the Wicked Witch of the West(ern suburbs). Then there was the challenge: Could even I grow marijuana? Maybe this was one plant I wouldn’t kill. According to Massachusetts law, each adult per household over the age of 21 is allowed to grow six marijuana plants. One would be plenty for me. I contacted Homegrown Massachusetts, purveyor of GrowKits, in September of last year and met with one of its founders, Nick Taylor, at his co-working office space in Boston in early October. The 34-year-old self-described serial entrepreneur, who doesn’t smoke pot, shared his brainstorm with a friend, who does. At the time his friend was learning to grow on his own. The friend loved the idea so much he encouraged Taylor to develop it. And he became a silent partner in the business. To design the kit the pair brought in a third friend, from a branding and advertising background. She is also a silent partner. Marijuana may be legal in Massachusetts, but it is not without stigma. The three spent that January figuring out what the kit would look like. When they had a prototype, in February, they started testing it out with friends and family. They worked on iterations through June, when they finalized growing instructions and started selling the kits. By October, they had sold about 100. Three months later they had sold more but won’t divulge numbers. “Our customer base ranges from kids out of Northeastern to baby boomers in Lexington who did it way back in the day,” says Taylor, adding that the majority are in their 30s, like him and his partners. The company’s marketing strategy at this point is to rely on word of mouth; the partners are waiting until the Massachusetts Cannabis Control Commission releases its regulations before implementing a full-on push. I learned about the GrowKits from a friend, who heard about it from a friend. And so on. And so on. Attractively packaged, with each of the components laid out individually in a large white box, some items bundled fashionably in burlap and tied with twine, the kit contains a germination glass to soak seeds; a sprout bowl and germinating papers; a spray bottle; 2 seedling starter pots; 2 large felt planters; 2 water saucers to go under pots and planters; an LED grow light; a grow light hanging system; plant ties, splints and stakes; pruning shears; bud drying materials; a bud curing Mason jar; and a humidity curing pack. 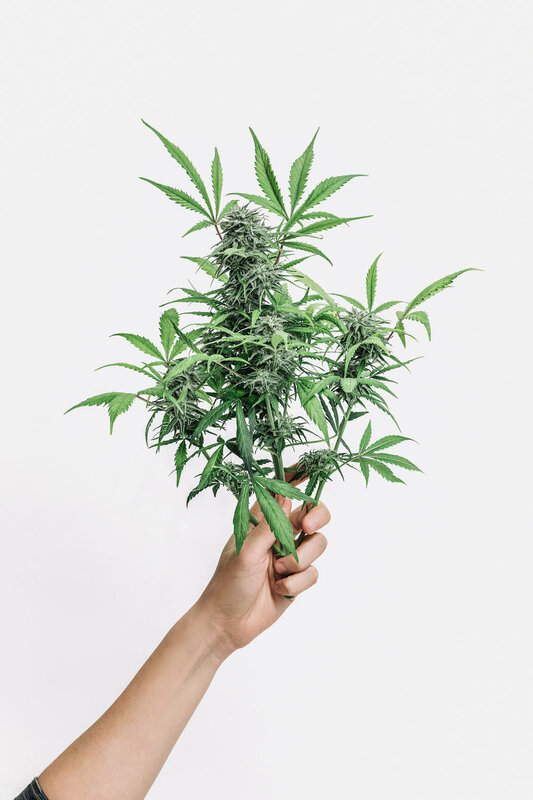 And perhaps most important, there is a 13-page growing manual, based on a combination of the partners’ personal knowledge and experience, some research and feedback from fellow homegrowers. “It’s not quite as easy as Blue Apron,” Taylor concedes. I can vouch for that. About three years ago, when dinner-in-a-box was the hot new thing, I made dinners from one Blue Apron delivery as research for an article I was writing. While the experience did not turn me into a believer, I could see how the meal kits might make life easier for busy people who don’t know how or don’t have much time to cook. Growing marijuana—or any plant—takes a lot more time than making a meal and there are more ways to mess it up. But using Homegrown Massachusetts’ kit does make it easier by providing everything you need in one package and giving very clear, easy-to-follow instructions—with pictures. And access to online help. “We hold our customers’ hands,” Taylor says. And on the scale of houseplants, though cannabis is in the Cannabaceae family and technically an herb (related to roses, strawberries, blackberries, apples, pears, plums, peaches, almonds, figs and mulberries), it kinda grows like a weed. From seed to harvest takes three to four months. 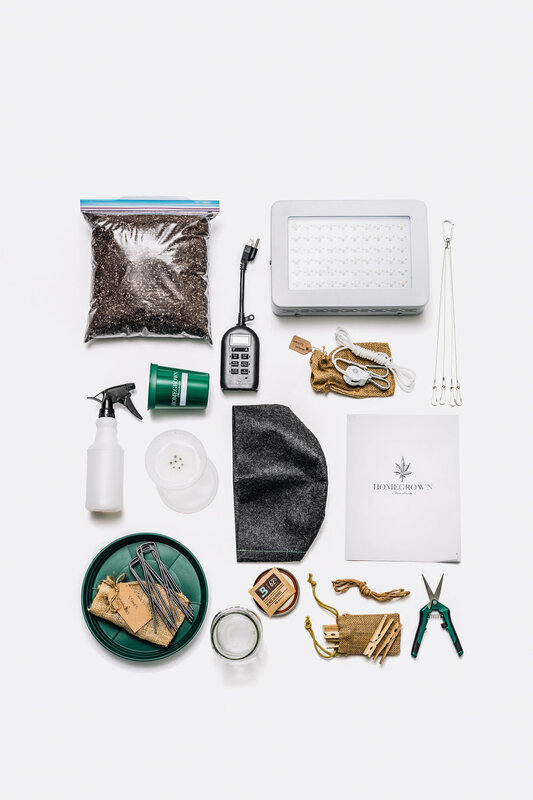 GYOstuff, which opened in 2010, is a full-service shop selling supplies, classes and in-home consultation for people who want to grow all sorts of things at home, indoors or out, in soil or hydroponically. For a complete novice, walking into the shop for the first time, with its multiplicity of lights and grow tents in a range of sizes, can be a bit intimidating—at least compared to opening a box at home with everything you need to get started. But talk to anyone in the store and you will feel anything but intimidated. When he and his partners opened the store, Constantinou says, they knew legal marijuana was coming to the state. “We knew it was a long way off, though.” It took six years. Since marijuana was legalized, it has accounted for roughly half of their business. “Not everyone is open about it yet,” he says. In Massachusetts, it’s easier to grow indoors than out, Constantinou explains, because of our climate—you can grow year-round indoors—and for security reasons. Indoors there is no need to worry about bugs or about plants being stolen. While setups can be as simple as a plant on a table in a closet under a light (mine), they can get more sophisticated, with several plants in a humidity-controlled grow tent under much higher-end lights than the one I have. Constantinou, who has a background in construction, loves gardening and applies his construction expertise to assembling grow rooms for customers who want that level of assistance. Sharon Jones (a pseudonym), the personal assistant for a finance executive in Boston who has smoked marijuana for decades, turned to GYOstuff to create a grow space in the basement of her employer’s home. (He has two grown children who no longer live there.) When pot growing and possession were legalized, Jones asked her boss if he wanted to start to grow some at home. “I suggested it more as a joke,” she says. He was seriously interested. But he didn’t have time to set up or maintain a garden himself. Jones took a class at GYOstuff. Most of the classes there are private. “We tailor classes dependent on what people are going to grow,” Constantinou explains. A lot of the material will be the same from class to class, like the setup and maintenance of the garden. But the details, such as pH or nutrients needed, may be different. The shop owner adds that some attendees prefer anonymity as they approach this new craft. “We like to get people comfortable in a one-on-one setting or with friends,” he says. Jones sees no end to her gardening project, nor does she seem to want to wrap it up. “It smells really nice down there. It’s very well contained. I think we’re going to continue forever. I think it’s part of my job description,” she laughs. Just like Blue Apron did not convert me into a believer, I’m not sure how my fall-winter gardening project will translate to the future. While I didn’t find it relaxing per se, it didn’t stress me out. And not only did I not kill my plant, it has thrived, which has been enormously rewarding. As I get ready to file this story my plant is almost ready to harvest. I still haven’t decided whether to save clippings to clone it and start the process all over. For now, I have to focus on the harvest. Do I wait until 70% of the pistils have turned from white to amber? More? That depends on whether I want an energetic or mellow smoke. Do I even want to smoke it? Craig, we need to talk. Meet me in your closet. This story appeared in the Spring 2018 issue.